I am interested in helping to get additional tests available for the colorimeter. In particular, I am interested in pH(6-8), alkaliniity and calcium hardness). This will allow for me to move away from my ColorQ colorimeter to just using IORodeos and will provide most if not all the tests that aquaponics folks would need. Thanks for posting the link to the pH tests ! This week I will be repeating the pH calibration tests with phenol red and bromothymol blue and I will post the results here and on the Wiki once these are finished. There was also some interest in how to make the pH calibration solutions so I will also add that information to the Wiki this week ! I have added some graphs to the wiki from the latest pH testing with the colorimeter that I did this week. I am pretty happy with this data. At this point I think it has been repeated enough times that we can put together a good pH calibration curve for the colorimeter now. One of the issues I had before was actually just checking the pH of the calibration solutions that I was making. I had to spend some time getting the pH meter and stir-plate set-up to do this. Measuring and adjusting the pH of each calibration solution was probably the longest step ! The graphs from this week are all on the Wiki. 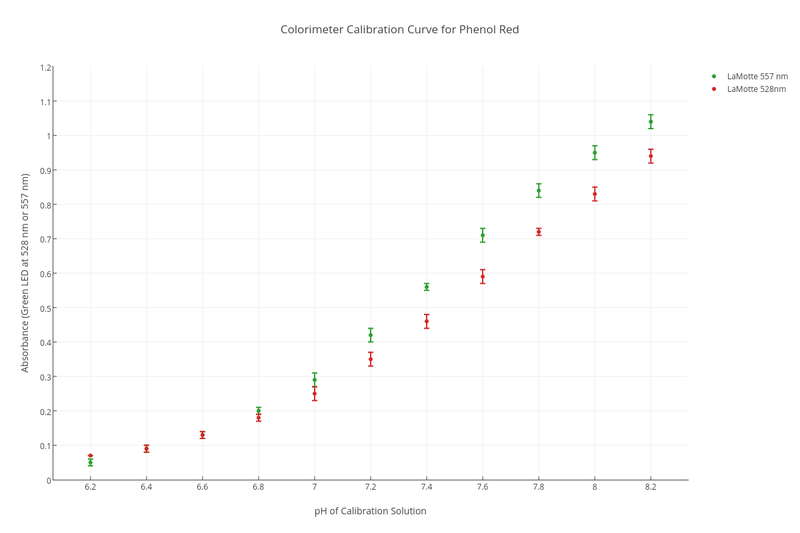 Here is one of the calibration curves measuring Phenol Red with two different LED wavelengths. Phenol Red is best measured at around 557 nm so we put together a custom board with a 557 nm green LED. (We will make this available in the store shortly). However, the 528 nm green LED on the RGB board also works well, just slightly lower absorbance values as you would expect. The next step will be for me to post the data as calibration curves which you can import into the colorimeter program. That will be happening next week. @Jo how's it looking? Any luck in looking into alkalinity or calcium hardness? I have been using the Lamotte chems for both of these so maybe we can reuse them assuming the LEDs do the right thing. Any update would be great! @ebeuerle Hi Ed. Right now we are making some updates to the Colorimeter software to include pH as a measurement option and finalizing the calibration data. I hope to have this finished very soon so you can start measuring pH with your LaMotte indicator. Next up is alkalinity. I wanted to completely be finished with pH before staring a new test, but I think we are almost there. Could you post here a link to the LaMotte test kits you use for alkalinity and calcium ? I will order those next. Thanks. @Jo Makes sense! Thanks for the update. Here's the codes off the bottles for LaMotte alkalinity and calcium hardness: Code 7038-G (alkalinity) and Code 7042-G and 7041-G(Calcium hardness - need both). 5ml test tube used: need 5 drops from each for Calcium hardness. @ebeuerle Hi Jo - any updates? I'd like to use those pH assay tables as a baseline for my own pH tables. Is there a way to input them into the software? Either entering the values into the GUI or creating a file for import? I couldn't find any way to edit an absorbance value in the GUI & couldn't find where on my Mac the other assay tables (like ammonia) are stored. OK I found the assay table files on my Mac, created a new one, 'pH' & transposed the average of the LaMotte & Hach 528nm average results (I have the standard issue 528nm green LED). The data is pasted below but in the Colorimeter GUI it incorrectly gives me a pH of 9.5(ish) for a green LED absorbance of 0.555. I suspect this has something to do with the way the line of best fit is drawn... all the default assay tables' absorbances are linearly proportional to the ppm/uM level, but pH isn't (look at the graph). Also, I think it's struggling with the 0.00 absorbance value being pH 6.0, not 0.0... when i refit the data to a range of 0-2.2 pH (down from 6.0 to 8.2), the same test gives me a more sensible 1.5 value which is within the new/fake data set. Any ideas how to get a good curve fit through the data set whose 0.0 absorbance is a pH value > 0? Try going through these steps of downloading the data, loading into the plotting program and fitting the data before exporting. By the way, this pH calibration data will only work for measuring pH between 6-0 and 8.2. Are you willing to share the API results (bromothymol blue)? I have pH calibration for API pH 6.0-7.6 and API High Range pH 7.4 to 8.8. The curves are non-linear (polynomial), especially for the high range. I am new to IO Rodeo Forum and I am wondering if there are discussions regarding non-linear calibrations (I looked and didn't find any). I imported your data into the colorimeter-plot program and tried looking at a couple a nonlinear calibrations. The 4-th order polynomial fit looks pretty reasonable. Thanks @Will-Dickson! I also just discovered that I have to select the fit type before plotting and it all works. Doing this should help @briansone get around the issue of the plot trying to intercept with (0,0). Hmm... the colorimeter software won't let me fit beyond 3rd order. Any error message? or are the radio buttons disabled? There isn't an error message. When I select 4th order and hit the plot button, nothing happens. But I choose linear, 2nd order, or 3rd order it works fine. Same data I posted, same that you used. I'm using that Mac OS software version 4, which appeared to be the current version when I looked yesterday. The fix is in the source in the repository (https://bitbucket.org/iorodeo/colorimeter/src), but I don't think I have packaged up new stand alone versions for Mac or Windows since the fix. I'll try to put together some new standalone versions this weekend. Hi @Will-Dickson, I haven't noticed a bitbucket update in the downloads, and I'm afraid I don't have sufficient Python experience to update it myself. Keep me posted and I look forward using the updated version. Thanks! Sorry about the delay. I've put new versions of colorimeter software (colorimeter-v05) for Windows and Mac OS here https://bitbucket.org/iorodeo/colorimeter/downloads/ Let me know if you have any issues. @Will-Dickson Thank you! I very much appreciate your help!